In my house it was always hard boiled eggs topped with horseradish, kielbasa with spicy brown mustard, and soft subltly sweet babka covered in butter for Easter breakfast. Nowadays I can’t seem to find that same quality babka we used to get, so I worked at coming up with my own moist and flavorful recipe. It may be more work to make your own bread for Easter breakfast, but the superior quality of the homemade version is so worth the effort. Scald milk then add butter to it until it has melted, and the milk’s temperature is around 102 degrees. In the bowl of a stand mixer or a large mixing bowl add flour, sugar, salt, and yeast. Add the milk and butter mixture, eggs, and raisins and mix until the flour has been completely moistened. Let rest covered with plastic for 15-20 minutes to allow the flour to fully hydrate, this will make kneading the sticky dough easier and quicker. Knead the dough by stand mixer or by hand on a lightly floured counter for 10-12 minutes or until the dough becomes smooth and only slightly sticky. Cover the dough with plastic wrap and let rise in a warm spot until doubled in bulk. This could take up to two hours depending on the temperature of your home. Grease two 9 inch cake pans. Once the dough has risen turn it out onto a lightly floured work surface and divide in half. Shape each half into a round and place in greased cake pans. Lightly oil or spray the tops with cooking spray and cover with plastic wrap. Let rise until doubled in bulk (approx. 1 hour). Preheat oven to 350 degrees 30 minutes before you plan to bake the loaves. 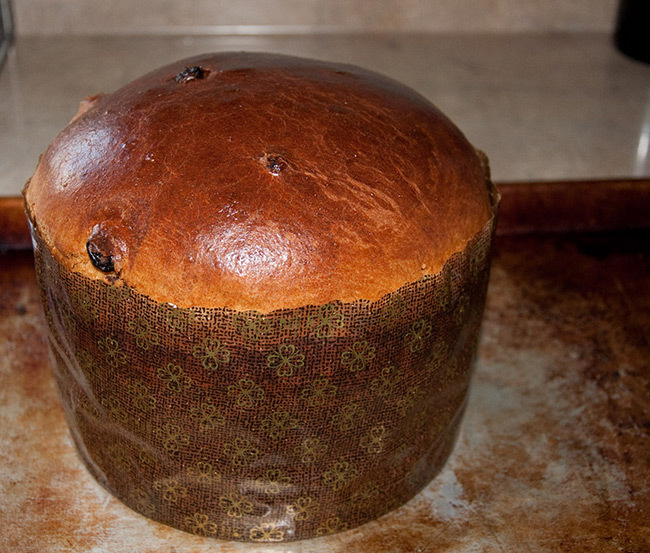 Bake for 40-50 minutes or until the loaves are a deep brown and sound hollow when tapped on the bottom. Their internal temperature will be around 195 degrees. Hi, I would like to make my 93 year old grandfather a babka for Easter. May I ask where you procured your paper/baking pan? Thank you! Your babka looks delicious!